In all our travel we’ve yet to personally experience a crime or major mishap, with the exception of someone denting our rental car bumper without taking responsibility and leaving a note. That person, although anonymous, tops my home refrigerator list, which is reserved for lousy retail businesses, shallow celebrities and politicians who don’t keep their campaign promises. That refrigerator list continues onto our dishwasher and pantry doors. Check the weather before exploring in national parks. 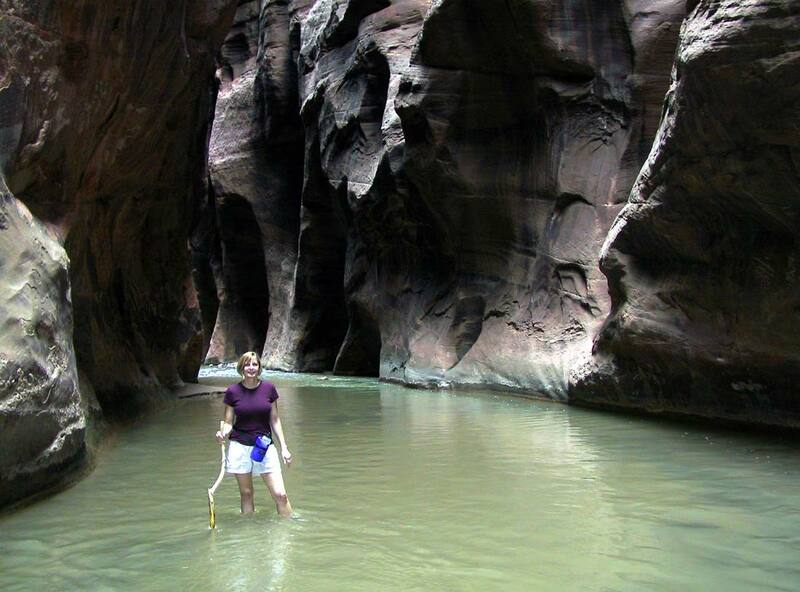 Places like The Narrows in Zion can become deadly with even a little rain upstream. Despite our good fortune, parks, like other tourist destinations, do experience crime and accidents. People who regret their visits are either victims of poor judgment or simple fate – being in the wrong place at the wrong time. I don’t want to alarm you with this blog post; I’m merely offering some basic national park safety tips that could help make your vacation what you it should be – a great memory to cherish for a lifetime. It's exciting to see animals on your national park visit ... but don't approach them. Stow your valuables. Tell someone. Know the weather. Never, EVER (notice the loud all-caps, which I normally deplore, but felt the emphasis was EVER critical) leave valuables in your car. We always load our backpacks with wallets and anything else of value or sentiment. And when we park to enter a visitors’ center, lodge or diner, I routinely take all of my camera equipment with me, even though a few people might mistake me for a paparazzi sneaking around the postcard rack. Be sure to tell someone where you’re going. Start your trip by emailing your itinerary to a family member or friend. Once you’ve reached your destination, take a similar precaution during your individual hikes and side trips. If you’re backpacking and overnighting, be sure to register in advance with the park service. Permits and registration are often required. Even if you’re going on a long day hike, let the rangers know, leave a note in your room or tent, or email someone. It can’t hurt. Check the forecast. Weather in national parks can change abruptly. For instance, you don’t want to be hiking into Bryce Canyon or standing on Yosemite National Park’s Half Dome when there’s a chance of lightning. In addition, there are parks whose landscape can become dangerous with even a little rain from miles away. Slot canyons like those found in Zion National Park and Grand Staircase-Escalante National Monument are examples of gorgeous locations that can turn deadly during pop-up storms. We always check the forecast with rangers at the visitors’ centers. Skip this step and you’re just foolish. Follow the posted rules when visiting national parks. They are there to keep you safe. Pack a first aid kit. Don’t approach animals. Stay on the trail. Carry a first aid kit. Yes, it’s extra weight. But not that much. Ours contains the usual items, along with chemical ice pack, insect bite stick, Advil, antibiotic crème and Moleskin. And if they made a tiny MRI scanner, I’d pack that, too. I also carry an epinephrine injector for my personal disagreement with wasps and hornets. And while I used to carry a snakebite kit, the more recent advice from medical experts warns about the effectiveness of these kits. Know your animals. We’ve encountered black bears and pit vipers but, in every situation, they were only interested in escaping our company. We know; it’s not personal. We don’t advance to photograph wildlife because, well, they’re wild. And unpredictable. Attacks do happen, sometimes at no fault of the humans, but often because people make careless mistakes. 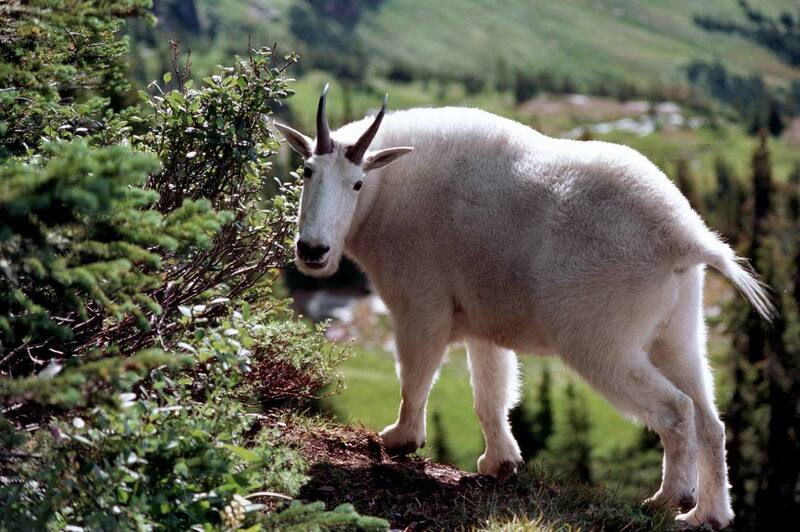 Even animals that rarely show aggression, such as mountain goats, will attack. One final habit of ours – we never hike without bear mace in grizzly country. In continental U.S., that’s usually Yellowstone and Glacier national parks. For Pete’s sake, if there was one national park safety tips that tops them all – follow the rules! 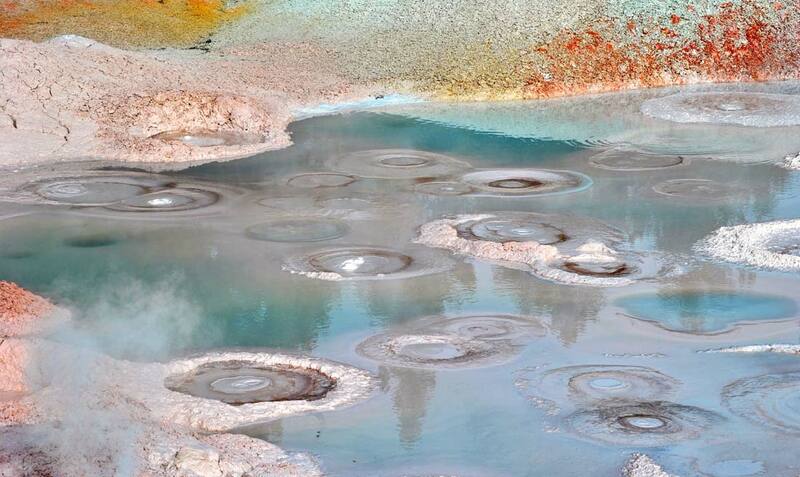 It seems that every year someone steps off the boardwalk in Yellowstone’s Geyser Basin and perishes by falling through a thin, thermal surface, despite the trail warning signs and park literature cautions. I try, but it’s very difficult to feel sorry for someone who ignores the safety information. My final national park safety advice: study your destinations in advance. Before a recent hiking trip in Saguaro National Park and the Sonoran Desert, I camped in front of my computer screen and researched all of its beauty and potential hazards. I arrived prepared. Nothing tragic occurred. And I left with only great memories.